Finally! The famous Australian tanning product has touched down in the UK. Well, Superdrug to be exact. And I could not be happier. Ever since I watched Karissa Pukas‘ tanning routine I knew I had to seek out this product. I have no kwams about trying new self tans. If a product can give me a healthy glow without damaging my skin with evil UV rays, I’m all about that life. It is also a well known fact amongst my friends that I am melanin deprived, therefore incapable of obtaining a natural tan. Bondi Sands claim that the foam “glides effortlessly over your skin” whilst drying to “a natural, flawless tan.” Their website notes that the product is “enriched with aloe vera for soft smooth skin with a healthy natural bronzed look like a day on Bondi Beach.” I’m sold. First of all the smell. I never thought I would say this about fake tan but it smells heavenly. Bondi Sands has a coconut scent that never develops into that infamous biscuit aroma. I chose to go for the Dark Self Tanning Foam as being unorganised is my speciality, so I always find myself stressing the day before a night out that my tan isn’t going to be dark enough. I applied a first coat with a tanning mitt, waited thirty minutes then reapplied to achieve an even, golden colour. I found the drying time to be minimal, major brownie points, so you are not left with that awkward feeling like you have to air your body for about an hour afterwards. The only downside I found is that the product does transfer onto your bedsheets more than other tans are prone to doing so. Overall I love the Bondi Sands foam. Once washed off it leaves a beautiful olive toned tan to your skin which wears well throughout the week. My top tanning tip to achieve a long lasting tan is to use an exfoliating glove when in the shower and moisturise daily. I love using The Body Shop’s Moringa Body Butter to do so. This will aid your faux glow in fading without scaliness occurring. Compared to St. Tropez’s Bronzing Mousse for around £20 you get 120ml, with Bondi Sands the 200ml bottle is £14.99, meaning you get more bang for your buck. And personally, I think a better self tan. The brand is also cruelty free which makes my heart extremely happy! 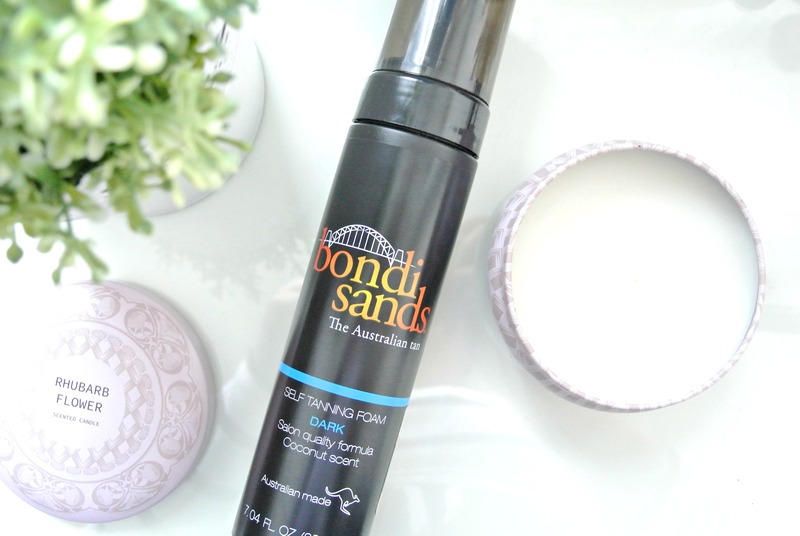 Next on my list to try from the brand is the Bondi Sands Self Tanning Lotion. Have you given any of the Bondi Sands self tanners a whirl?